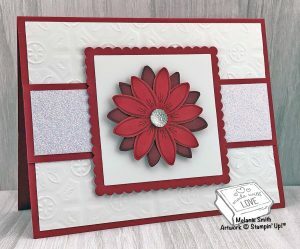 With today’s card I have created a fun focal flower by simply stamping with the Making Every Day Bright stamp set which focuses on year round stamping. 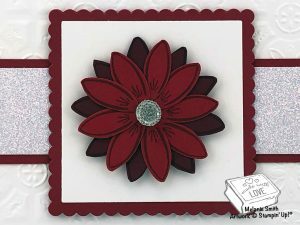 This stamp set coordinates with the Making Christmas Bright stamp and punch bundle. I used the coordinating punch to cut a portion of the flower petals. 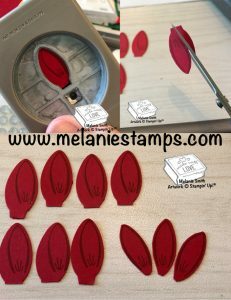 Finally I used my Stampin’ Snips to trim the other side of the petal. After attaching the petals I added a Clear Faceted Gem to the center which really attracts the eye. 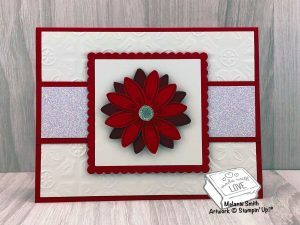 I have also added a piece of glimmer paper and I have embossed the white background using the Tin Tile embossing folder. See product list below for easy clicking!!! Previous postSneak Peek Video ~ Love, Live, & Share It!!! Next postMaking Christmas Bright ~ Weekly Wrap Up!